for 20 minutes.Here goes the recipe..
Line a 12-section bun tray with paper cake cases. Blend the coffee powder with the boiling water.Put the butter,caster sugar,egg,flour and baking powder in a bowl.Add the coffee and beat with a electric hand mixer for 2 to 5 minutes on medium to low speed until light and creamy.Stir in the chopped walnuts.Divide the cake mixture between the paper cases. Bake in a preheated oven 180C for 20 minutes or until risen and just firm to the touch.Transfer to a wire rack to cool. Blend the coffee powder with the boiling water.Beat the butter and icing sugar in a bowl until pale and creamy. 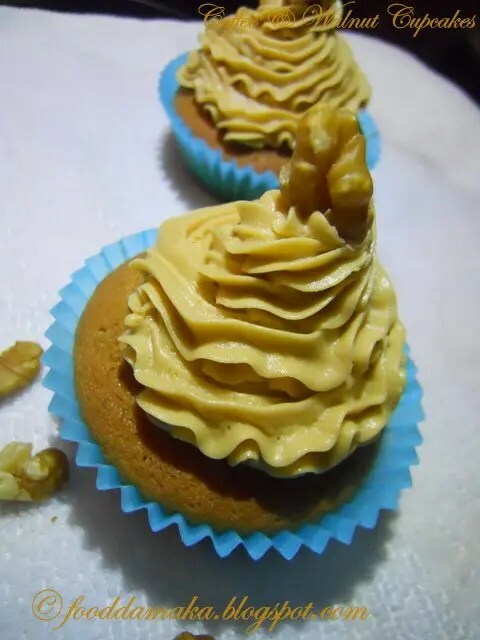 Put the butter cream in a piping bag fitted with a star nozzle and pipe swirls over the tops of the cakes.Decorate each with a walnut half. 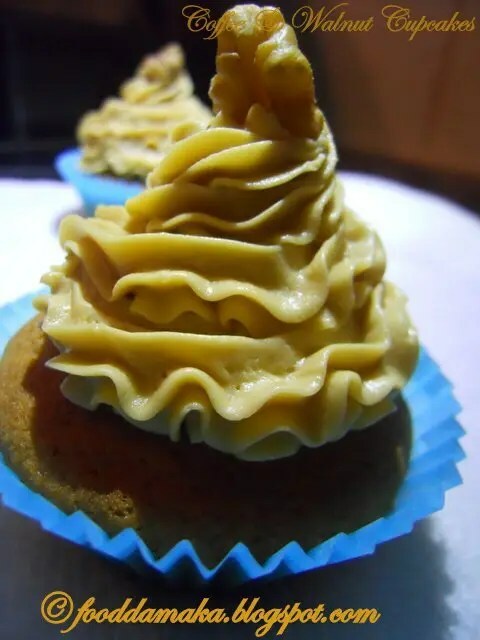 Delicious and mouthwatering cupcakes. Wonderfully prepared. Omg, look at those marvellous cupcakes, feel like licking that frosting. I love coffee based bakes and those cupcakes look gorgeous.